Rose and walked Mix before moving into the Bothy to get caught up. Presbytery papers normally go out on Tuesday but I had been with the Moderator morning, noon and night (and I couldn’t do anything earlier because the reports don’t reach me until Tuesday). So I spent all morning working away at getting things ready to send out – there are only half a dozen folk who need paper copies of things because they don’t have email but that half dozen results in so much extra work and expense. I drove into Duns and posted the reports and came back for lunch in the farmhouse. I got a copy of the Berwickshire News which had a picture of the Moderator on the front page and a double page spread inside. It was very good and as I have taken most of the pictures I felt especially pleased (and they looked extremely good). Maybe I could have a career as a press photographer! In the afternoon I sent out all of the presbytery materials by email and then got a few more boxes into the Bothy so that I could unpack them and store more books on the shelves. It is an ongoing activity and I need to try to get it completed. Tom arrived to take Rachel, Mum and me to the Holy Week service which tonight was a Maundy Thursday Communion Service at Abbey St. Bathan’s conducted by Stephen. 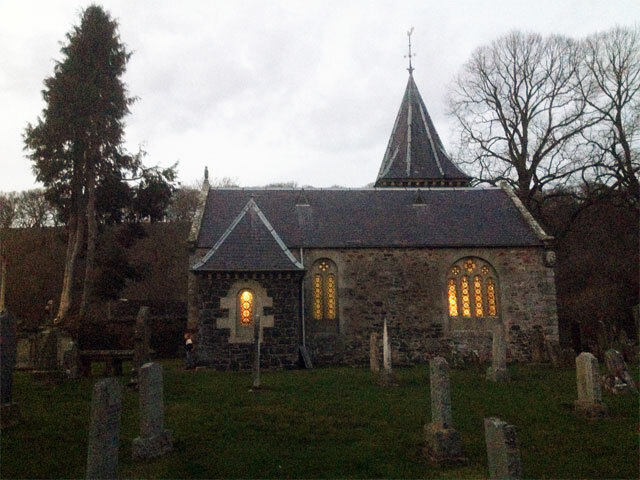 It was a good simple straightforward service in the beautifully restored little church which is now in private ownership but which we are allowed to use. Coffee was available after the service after which Tom drove us home and we were able to watch the UK Leaders’ Debate. It was interesting and I don’t know why David Cameron refused to debate further than this one event. I suspect that it is going to be harder for him to win the election than it is for a left wing alliance to assemble the votes to keep him out. And yet he debates well and out performs Ed Milliband in my view. It was good to see the other leaders present and I was surprised by how good a debate it was and how it did manage to flow. Nicola Sturgeon did extremely well, and Plaid Cymru’s Leanne Wood did well – although she did not speak to the rest of the UK in the way that Nicola Sturgeon did. I thought that Natalie Bennett of the Green Party was a bit out of her comfort zone and Nick Clegg seemed to be treated as an irrelevance by the others. What did I think of Nigel Farage? Well, I didn’t like what he said but I am sure that he was ticking all of the right boxes for his supporters and that they will have thought that he performed well. In fact, it was that kind of debate, no one landed a knock-out blow on any of the others and many people will feel that their person did best. I think that it was a pity for the greens that they didn’t use Patrick Harvie from Scotland because he is well used to the cut and thrust of debate and, in his own way, has become quite charismatic. I don’t know who had been advising Ed Milliband but his long soulful gazes into the camera must have been a mistake. We walked the dogs and went to bed. I imagine that it will be wall-to-wall politics on the television for the next month.